08/30/2017 — According to Sergeant Brian Bickman of the Riverside County Sheriff’s Department, on Friday, August 25, 2017, at 10:06 p.m., officers from the Rancho Mirage Police Department responded to Bob Hope Drive and Rancho Las Palmas to investigate a traffic collision. The investigation revealed a silver Toyota Camry was traveling northbound in the number two lane on Bob Hope Drive and collided with two bicyclists, who were also riding northbound. A 71-year-old, Yucca Valley resident, named Linda Jean Brechtel, was the driver of the Toyota Camry. Both bicyclists were injured as a result of the collision. Paramedics responded to the scene and transported one bicyclist to a local hospital for further evaluation. The bicyclist was treated and released with a non-life-threatening injury. The investigation revealed Brechtel was operating a motor vehicle while under the influence of alcohol. 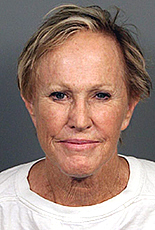 After being medically cleared at a local hospital, Brechtel was booked at the Riverside County Jail in Indio for DUI. The investigation is ongoing and anyone with information about this incident is urged to contact the Rancho Mirage Police Department at 760-836-1600 or anonymously through Crime Stoppers at 760-341-STOP (7867). The Rancho Mirage Police Department encourages the motoring public not to operate a motor vehicle while under the influence of alcohol or drugs. To report drunk drivers, please call 911. This entry was posted in DWI arrest photos, DWI Arrests by State, injury or death and tagged Bob Hope Drive, California Highway Patrol, Coachella Police Department, Driving Under the Influence, driving under the influence of alcohol, driving while impaired, Linda Jean Brechtel charged with DUI after mowing down two bicyclists, Palm Desert Police, Palm Desert Police Department, Rancho Mirage Police, Rancho Mirage Police Department, Riverside County Sheriff's Department, Sergeant Brian Bickman, two bicyclists. Bookmark the permalink.